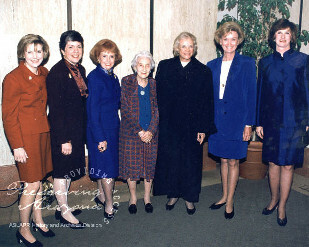 In 1998, almost 90 years after Arizona women were given the right to vote, five women were elected to serve in the state’s five most important government positions. Jane Dee Hull was elected governor, Betsey Bayless was elected Secretary Of State, Janet Napolitano was elected Attorney General, Carol Springer was elected Treasurer, and Lisa Graham-Keegan was elected Superintendent of Public Instruction. To this day, the Fab Five remain the greatest number of women to serve in a state’s highest elected offices at any given time. When were the Fab Five elected? What elected positions had women previously filled in Arizona? Who created the documents linked above? What do these documents tell us about the work of the Fab Five? What don’t these documents tell us about their work? Why do you think ninety years passed between when women were allowed to vote and when women filled all five of the state’s top elected positions?